A crucial proposal on protecting sharks and manta ray species has stirred debates and discussions ahead of a vote at the ongoing Bangkok conference on the Convention on International Trade of Endangered Species of Wild Fauna and Flora (CITES). �The Sunday Times learns the proposal would be put for a vote by secret ballot among CITES signatory nations at the conference where the Sri Lankan delegation is led by Wildlife Department Director General H.D. Ratnayake. Attempts to contact Mr. Ratnayake to know how Sri Lanka would vote were not successful. �CITES is often hailed by scholars and conservationists as the most effective international environmental agreement to date. Sri Lanka was one of the 178 signatory countries that meet once in three years to discuss measures to protect wildlife species threatened by trade-driven over-exploitation. The convention and its appendices list species that could be at risk and call for the control of import, export and re-export of such species through a permit system. They also state that species that are already threatened with extinction cannot be commercially traded. �More than 30,000 such species are given trade protection through CITES and 70 new proposals have been presented at the conference — the 16th meeting of the Conference of the Parties (CoP 16). Aquatic species top the conference agenda with proposals calling for the protection of shark and manta ray species among other threatened species. This species to be protected include oceanic white-tip shark, and three species of hammerhead shark and two species of manta ray — species found in Sri Lankan waters. The hammerhead shark is notable for its unusual shape of the head which has given it its English name. Locally, it is known as “Udalu Mora”. There are three species of hammerhead sharks — scalloped hammerhead (sphyrna lewini), great hammerhead (sphyrna mokarran) and smooth hammerhead (sphyrna zygaena). The scalloped and great hammerhead sharks have already been listed as ‘endangered’ while smooth hammerhead sharks are considered ‘vulnerable’ to extinction, according to IUCN Red List. Oceanic white-tip sharks (carcharhinus longimanus), said to be an aggressive species, live in deep waters, but fishermen have become more accustomed to kill them and as a result they are ‘vulnerable’ to extinction. Sharks and mantas live long and take time to mature sexually. Sharks and mantas have a long gestation period and produce only a few young. Small bony fish, which have many predators, usually lay thousands of eggs during one spawning season for the survival of the species. 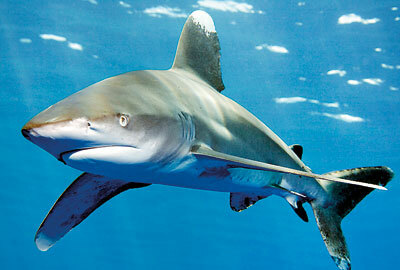 Sharks, top predators themselves, give birth to a few young during their life time as they face no major threats. But the situation is different today and they too face a major threat with the humans invading the ocean and engaging in a killing frenzy. But sadly, overfishing, driven by the high demand for shark fins and manta ray gill, does not allow the shark and manta populations to recover. Shark fin soup is a popular delicacy in China and other East Asian countries while manta gill plates are used in Chinese medicine. 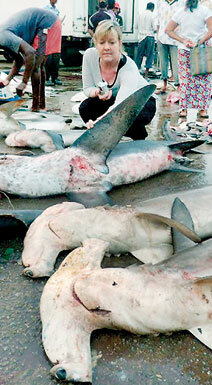 Hundreds of sharks are caught daily in Sri Lankan waters and there is a big export market for their dried fins. Dr. Jayewardene said many countries such as the Maldives and Seychelles had taken measures to protect their marine resources which in turn benefitted them economically through tourism and other areas. �“We need a more enlightened and sophisticated approach to marine conservation,” Dr. Jayewardene said drawing attention to the upcoming Marine Conservation Forum organised by the Colombo-based Indian Ocean Marine Affairs Co-operation (IOMAC). The Forum will focus on international experience and inspire countries like Sri Lanka to be more compassionate towards marine life. Fisheries Department Director General Nimal Hettiarachchie said the department was planning to start a monitoring programme on shark landings. He pointed out that Sri Lanka had already banned the catching of Thresher Shark, a species threatened with extinction. Conservationists said if the catching continues in an unsustainable manner, sharks and manta rays would decline to a point that the entire trade will collapse. “So it is better to act now before it is too late. Let’s hope that Sri Lanka will take the right decision in joining hands with the rest of the world in protecting fish in the troubled waters,” one conservationist said.